Happy Easter Stampers! I hope you are blessed to be able to spend this wonderful day with family and friends. Today’s card is another one that my friend Cheryl had us make on Thursday. She found it on Patty Bennett’s site. It was a swap card from Stampin’ Up! leadership done by Kathy Swanson. Isn’t it beautiful?!? 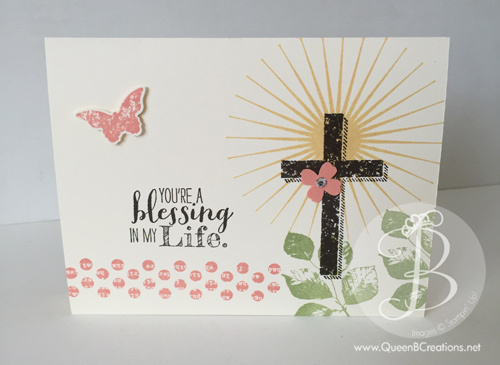 This beautiful card starts out with a Very Vanilla card base (8.5″ x 5.5″, scored at 4.25″). We then used the Kinda Eclectic stamp set by Stampin’ Up! and stamped the leaves in Pear Pizazz ink, the dots in Crisp Cantaloupe ink and the sun in Daffodil Delight ink. We then used the Stampin’ Up! Blessed by God stamp set and stamped the cross and the sentiment in Early Espresso Ink. We finished it off by stamping the butterfly from the Kinda Eclectic stamp set onto a scrap of very vanilla with Crisp Cantaloupe ink and punching it out with the bitty butterfly punch and attached to the card with a dimensional. The flower was punched out of a scrap of Crisp Cantaloupe with the flower from the itty bitty accent punch pack with a rhinestone in the middle and attached to the cross with a glue dot. Such a beautiful card! Remember you can purchase all the supplies used to make this card (and more) from my online store and if you order this week – Monday through Friday (April 6-10, 2015) you get FREE shipping!